I’d tried a different vintage of this wine last year, and I’d liked it. This year the label had undergone a serious facelift. Instead of a stylised greyscale image of the mountains of Chile, and some old style typeface it gets a giant image of what seems to be an Easter Island Moai statue. Whilst Easter Island is a Chilean territory and technically it’s off the coast of Chile, that’s rather like saying Canada is just off the coast of Galway in distance terms. No satisfactory explanation is offered for the Moai figure, but it’s a bold image and why shouldn’t people put bold images they like on wine labels. The label is stuck onto a pretty heavy bottle, maybe that’s what the stone guy is there to warn us of, the weight of the bottle. The wine inside is deep red and it does need some time to relax. If you think ahead then decant, if you don’t a super aerating gizmo may help, or in an emergency just swish it about a bit. The swishing option may not give the best results, but it’s better than nothig, as long as you’re not doing it over a cream carpet. 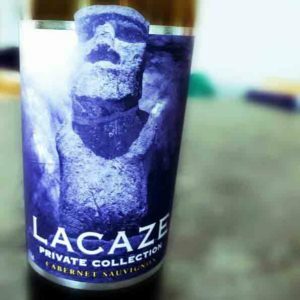 Lacaze Private Collection Cabernet Sauvignon ’14 smells of rich black fruits, and it has colourful legs. It’s dry with a medium acidity and quite a hit on tannins. The combination of all three can be a bit puckering, but it does calm down after a bit of time in the glass. It’s medium bodied with a medium high alcohol level, but perhaps not as high as it looks, if a wine can look like it’s got a high alcohol content. I think it can! Those dark fruits are crushed rather than overly stewed and there’s a bit of spice lurking in there, but it’s the fruit that wins out. This is a nice steady sipping winter wine, and at about £11 a bottle from Naked Wines it won’t break the bank. Unless of course you start yearning for a trip to Polynesia, which will dent your accounts, even if you do live in Chile, which, dear reader, my stats suggest is unlikely to be the case.